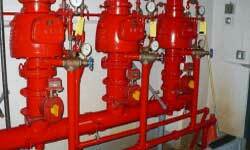 A dry pipe sprinkler system is a system with automatic sprinkler heads attached to a piping system containing air or nitrogen under pressure. The release of this pressure (as from the opening of a sprinkler) permits the water pressure to open a valve known as a dry pipe valve and the water then flows into the piping system and out of the open sprinkler head. Dry pipe sprinkler systems are installed in areas where wet pipe systems may be inappropriate such as areas where freezing temperatures might be expected. To learn more about all of our services, contact Columbia Fire today!